Took the wife's Miata down for an oil change and tire rotation. Contacted by the store, that they had discovered a "Bubble" in the sidewall and wanted to know what I wanted to do. After a quick look at the location of interest I concluded that we were looking at a Sidewall Impact Break. I had the store replace the tire with a new one and asked that the allow me to do a "Failed Tire Inspection". Here is what I found. Picture 1 is of the inflated LF tire on the car. You can easily see the "Bubble" on the sidewall under the molded word"OUTSIDE". What tipped me off to the damage being an impact and not a sidewall bubble or blister was the shape (more radial in nature than round) and the gradual nature of the rise of the shape. Sidewall blisters are normally more abrupt. The interior picture is what we see inside the air chamber at the location of the sidewall "bump". I have an arrow pointing at the stress marks of the body cord on the inner liner rubber. Picture 2 is of my initial examination cuts. Note I did not cut directly through the area in question as I did not want to destroy or contaminate the "evidence" that I suspected would be found in the area of interest. This is an important point that many inexperienced investigators sometimes miss. After removing the section of the tire, close examination revealed some of the initial Innerliner cracks / tears. Here is a close-up shot. 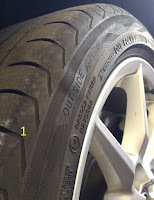 These cracks would grow and could eventually result is air loss through small cracks in the sidewall. It is important to consider that the cracks will not grow in just a couple of miles or maybe not even in 100 miles but if driven long enough would most certainly result in an air loss. 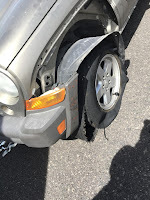 The driver would have no recollection of ever hitting a bad pothole or road debris so in all likelihood simply claim that the "Blowout" was due to some tire defect. Finally, we can see the separation of the body cord from the surrounding rubber. It is possible for this type of separation to allow the cords to move independently from the rubber next to the cord and the rubbing can generate heat which under the right circumstances could lead to a cord failure. 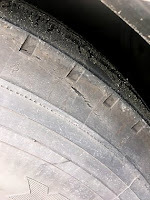 Again this could take weeks or months to progress to a loss of air but is another example of why few drivers connect the effect of a tire losing air to the real cause of suffering a sidewall impact break. This break was actually quite minor. A more severe impact was covered in THIS post. Belt Separation or not on a towed vehicle? Saw a post that started out with a claim of a belt separation on a front tire of a 2007Jeep Sport while it was being towed behind a Class-A rig. Luckily the owner posted a picture that I felt was suspicious. While the owner was going about getting the Jeep repaired and tires replaced I PM the owner and asked if they could provide better pictures. I advised full sunlight and straight on shots showing just the tread. Here are the two front tires after being removed from the Jeep. The LF shows the belt separation which led to the air loss when the edge of the steel belts cut & punctured the tire carcass. If we take a closer look at the LF and note the Tearing and Wearing of the tread elements we can confirm the tire was turned hard right while the Jeep was pulled forward by the tow bar. I have added a red arrow showing the direction the road surface moved across the face of the tire tread. I have circled a couple of tread sipe edges that show the lifting of the leading edge of the slots. "Sipes" are the name for the small, thin parts of a tire tread pattern that leaves small narrow slots in the tread surface. This "lifting" occurs as the edges of the sipe slot are bent down into the empty space in the tread patern. 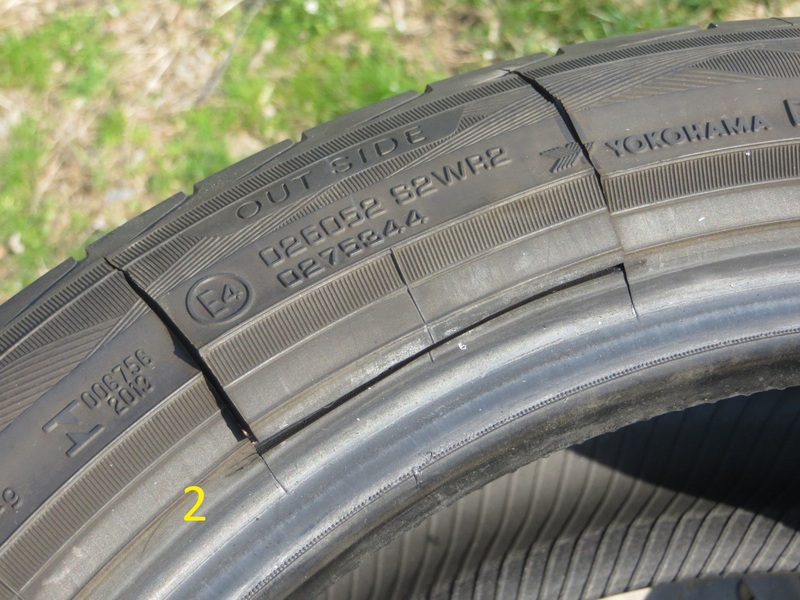 The yellow box identifies the relatively smaller level of wear on the trailing edge of the tread. of the larger tread blocks that have been worn away from having the tire being pulled sideways across the road surface. The owners of the Jeep believe the steering wheel lock was not engaged but so far inspections by auto mechanics have not been able to learn why the tires were being dragged straight ahead while they were turned hard right. As can easily be seen the result of being dragged put more load on the outer edge of the LF tire which suffered the greatest level of damage. I would estimate that the tires were pulled for a good number of miles based on the severe damage to the thread. Before the vehicles were stopped, the tires did appear to straighten the steering and pull straight ahead for a number of miles as the tread surface does not display surface scrub marks I have observed on other tires that have been slid across the road surface. Yes, there was a belt separation but it was caused not by any tire defect but by some mechanical failure of the vehicle steering system. IMO the above is a reasonable example of a "Failed Tire" Examination and analysis of the evidence thaat leads to a probable cause of the tire problem. Experience in tread wear paterna and anomalies is a definate pluse in completing this examination. 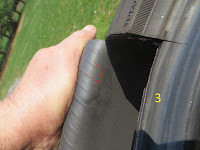 Saw a post from an RV owner who discovered something on the upper sidewall of a tire when doing a visual inspection. He was calling this a "crack" and was looking for input from readers of that RV forum. A number of readers chimed in with opinions ranging from "Time for NEW SHOES" and " That one is ready to throw some chunks." to a discussion on what was an acceptable spray tire protectant. The good news was that many recognised this damage as "curbing" that can occur when trying to go over a curb at a low angle. I have outlined the area I looked at which extends well past to obvious deeper damage. Especially off to the right side where the tire just shows signs of surface scrubbing. 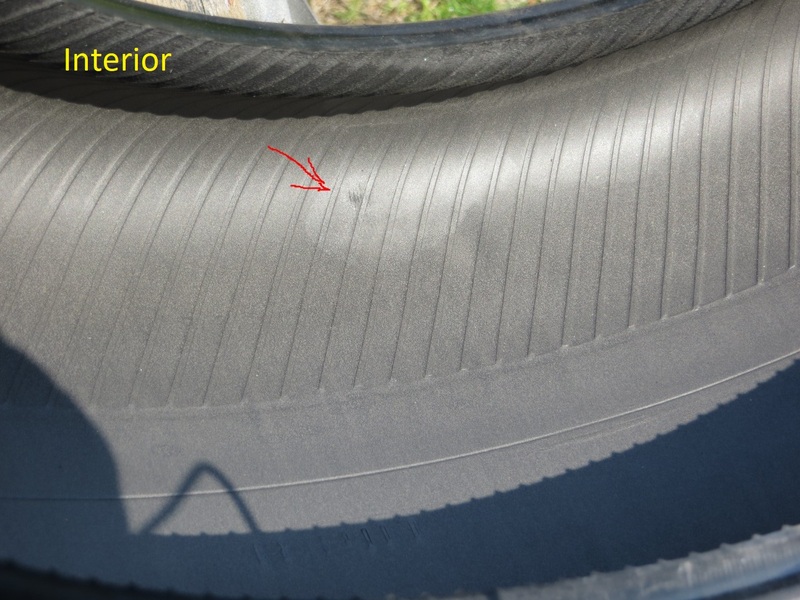 If I could physically inspect this tire I would take a close look at the right end (arrow) and confirm the suspect surface abrasion which would confirm no problem internal to the rubber. 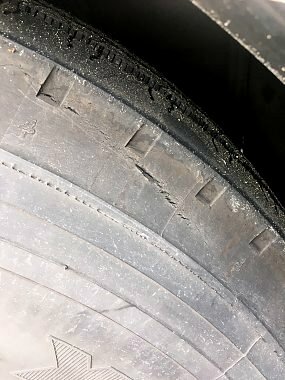 Not all tire damage is from a tire "defect". The owner did the right thing and had the tire inspected by a Michelin truck tire dealer who confirmed no defect but just curbing. What inflation to run when changing Ply Rating or size? Following a few different RV Forums, I see a number of people, that clearly do not follow this blog, have questions on what inflation to run. While many of these folks are discovering that the new Goodyear Endurance line seems to come with higher Load Range or only in larger sizes they end up not knowing what to do about inflation. In one case the person didn't even know they were buying a larger size so I do wonder sometimes how people managed to ever buy tires for their car if all they seem to know is that tires are round and black and seem to cost too much. When you replace tires on any vehicle, you should always be sure the load capacity of the new tires is equal to or greater than the capacity of the original tires on the vehicle. Regular readers of this blog know that load capacity depends on BOTH tire size and INFLATION level. You also know that there is a "Tire Placard" or "vehicle certification label" on or in all your vehicles that identifies the original size tire and the inflation recommended by the manufacturer. In the case of RVs the label also should tell you the GAWR which is the maximum load you should ever have on each axle confirmed by scale readings. So back to the original question of what inflation to run ? Example 1: There was a change in tire size but the Load Range stayed the same. A quick check of a Load & Inflation table for ST type tires we see that the ST205 is rated to support 1,820# @ 50 psi and the ST225 can support 2,150#@50 psi. This is a nice 18% increase in load capacity. I would suggest that in this case the owner continue to run 50 psi and enjoy better tire life. Example 2: There was a change in tire size AND in Load Range as can happen with the new Goodyear Endurance. Back to the Load & Inflation table for ST type tires we see that the ST205 is rated to support 1,820# @ 50 psi and the ST225 can now support 2,830# @ 80 psi. This is a 55% increase in load capacity. If the owner were to run the 80 psi as indicated by the tire sidewall the "ride" would probably be hard on the TT. In this case I would not follow the inflation on the tire sidewall. I would suggest that in this case the owner continue to run 50 to 55 psi and enjoy better tire life. 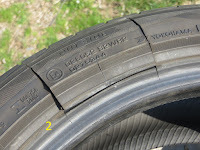 In this example the owner expressed concern about running lower inflation than marked on the tire. 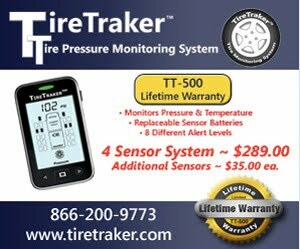 Some people even incorrectly said that running less than 80 psi would somehow overheat the tire. I pointed out that I saw no problem with running less than the sidewall inflation as long as the actual load had been confirmed with actual scale readings and that there was a good margin of capacity over the actual loading. Example 3. A Class-A owner wanted to change from a Michelin 275/80r/22.5 to a Firestone FS 591 295/75r/22.5. His reasoning was two-fold. First he was concerned about the historical reports of delays in getting the sometimes hard to find the Michelin size and second was the significant for him, cost difference. Both tires were LR-H . The owner did a good job of consulting the tire manufacturer's data sheets to learn the actual tire dimensions. 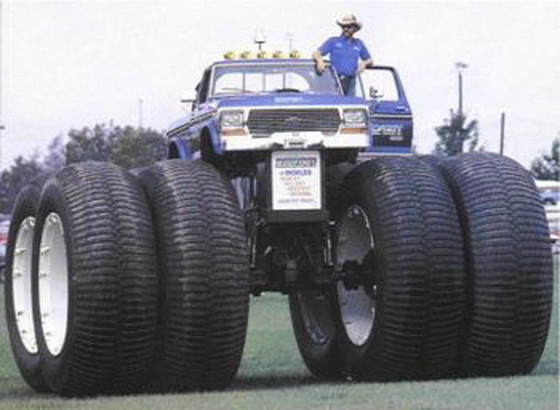 One poster had offered a generic tire size comparison web page but the numbers the page generated were clearly different and could lead to problems. 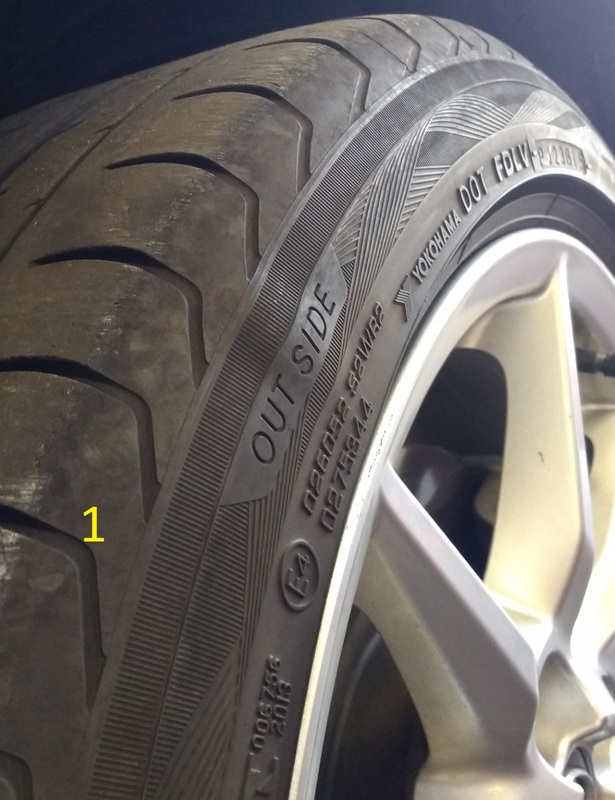 The load capacity for the Michelin and Firestone tires is 7,160 @ 120 The owner had also confirmed the dimensions were acceptable for the application.